Enjoy the Koran, the eternal Word of God, in English and free on your mobile. The best inspiration to start your day! The Quran online allows you to read the Suras and verses from the Koran, on your mobile, at any time of the day. 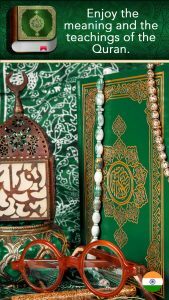 The Quran (in Arabic al Qur’an, “recitation”) is the word of Allah, which was revealed to the Prophet Mohamed by the Archangel Gabriel. Muslims believe that Muhammad was the final prophet sent by God to restore the Islam. Throughout his life, Muhammad continued to have revelations until his death. He couldn’t neither read nor write, so he recited the Quranic verses to his companions who also memorized and wrote it down. The practice of memorizing the whole Quran is still practiced among Muslims. Millions of people memorize the entire Quran in Arabic. The original manuscript was written in Arabic and he did not suffer any modification. The Quran was revealed in a living language currently spoken for more than 100 million people. We offer you the opportunity to read the entire Koran translated into English. The Koran is organized into separate chapters called suras and each one of these is divided into verses (ayahs). In total, there are 6236 verses.